Nietzsche was a prolific, complicated, and sometimes contradictory philosopher. There’s no neat way to reduce his whole body of work into a few key concepts, especially because that body of work was in many ways one enormous project that was constantly being refined and revised. You certainly can’t reduce that project into a handful of pithy quotes. But Nietzsche also happens to be that guy who said something about the death of God and the will to power. Everyone knows that! And so everyone seems to feel qualified to opine on his philosophy and legacy without having made a serious study of either. The whole point of the Gospels is that Rand’s value system leads to profound misery and spiritual loss. And the whole point of Rand is that Nietzsche was onto something. Rand’s “individualism”–if that is what one wants to call her juvenile fantasies about her industrialist heroes–owes as little to Nietzsche as to Smith. Nietzsche loathed capitalism and capitalists (and the cultural and aesthetic vulgarity he saw as their legacy) and also despised what he called “the selfishness of the sick” (Thus Spoke Zarathustra) and the “self-interested cattle and mob” (Will to Power). What he admired was “severe self-love,” the kind “most profoundly necessary for growth” (Ecce Homo). 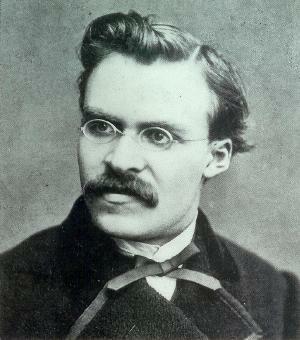 “Virtue, art, music, dance, reason, spirituality”–all the things “for whose sake it is worthwhile to live on earth” (Beyond Good and Evil)–all demand such severe self-love, and for this reason, and this reason only, Nietzsche wanted to disabuse those capable of such excellences of their false consciousness about the morality of altruism. He certainly did not think everyone ought to be selfish, or that the pursuit of material goods had any value, or that indulgence of selfish desires was a virtue. What he did think is what is almost certainly true: namely, that if someone like Beethoven had taken Christian morality seriously, and lived a Christian life, he would not have accomplished what the actual Beethoven did (one need only read the famous Maynard Solomon biography to see that Beethoven was no moral saint). The “John Galts” of the world are just a more prosperous example of the “self-interested cattle and mob” Nietzsche always derided. That Rand drew inspiration from Nietzsche tells us only how easy it is to misread his work. Probably millions of troubled adolescents have projected their neuroses onto his aphorisms and walked away clinging to a deeply warped and blinkered vision of his philosophy. That doesn’t mean we should judge him for it! Nietzsche is no more responsible for Rand than he is for Jared Loughner, or the authors of the gospels are for Jerry Falwell. It might very well be true that Rand’s “point” all along was that Nietzsche was onto something. But even if that’s true, it’s barely half of the story — because if Nietzsche was onto anything, that means Rand most certainly was not. This entry was posted on Sunday, April 17th, 2011 at 10:32 pm and is filed under Philosophy and Politics. Tagged: Friedrich Nietzsche, Objectivism. You can feed this entry. You can leave a response, or trackback from your own site. I don’t disagree, yet I still feel pretty comfortable calling Nietzsche, as an intellect, a monster. I don’t deny there are things in his work that are morally repugnant. But I think his contributions to human understanding are invaluable and far outweigh his transgressions. I agree with the premise here, that unless you’ve actually read and can comprehend what Nietzsche wrote, and the context in which it was written and his state of mind when writing, it is foolhardy to try and superimpose your thoughts onto his. (Generally; I’m certainly not pointing at you in particular.) His depression and tragic love-life are vital in seeing what pushed him to his conclusions, as well as how different was his living environment to what we enjoy today. I haven’t read anything Ayn Rand-ish, but it sounds as if she needed support for her distasteful and heartless lack of empathy for everyman. Nietzsche probably was just one of the easiest for her to twist into compliance.